Senior Lecturer at Diplomatic Academy of the Ministry of Foreign Affairs of the Russian Federation. ﻿From the Russian point of view, the choice is of two evils: the entire Turkish political establishment is far from being pro-Russian. Erdogan is, in that case, the lesser evil, which means he is pro-Russian in the context of interior and exterior political situations. Russia has managed to assemble at one negotiating table Iran and Turkey – two countries, which were irreconcilable opponents historically. Given that they have different interests and positions on a variety of issues, this is one of the key formulas to guarantee the security: if they manage to work out common approaches, it will be a breakthrough. The talks between the Russian and Turkish presidents in Sochi on May 3 showed that relations with Moscow play a very important role for the development of the Turkish Republic and can be vital for the further strengthening of Recep Tayyip Erdogan’s authority. 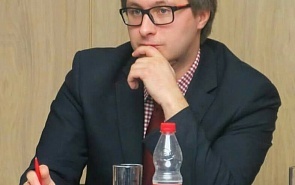 Vladimir Avatkov, expert of the Valdai Discussion Club, associate professor at the Diplomatic Academy of the Russian Foreign Ministry, director of the Center for Oriental Studies, International Relations and Public Diplomacy, said this in an interview to valdaiclub.com. The gap in the votes in the Turkish referendum about constitutional amendments was minimal: 51.2% for and 48.8% against. On the one hand, it gave the president of the country Recep Tayyip Erdogan almost absolute power, on the other it cemented the internal division of Turkey into supporters and opponents of the country's leadership. The April 16 referendum will focus on power distribution rather than institution building. In other words, the organizers saw it as an opportunity to expand the President’s powers and allow him to rule longer. People are ready to support Erdogan's course, but they are not going to vote for him based on his personal qualities – they would rather support institutional transformations that could influence Turkey’s future. In many respects the upcoming referendum is about the future of the system, which will set in after the current president goes.